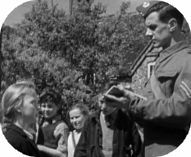 The residents of a British village during WWII welcome a platoon of soldiers who are to be billeted with them. The trusting residents then discover that the soldiers are German who proceed to hold the village captive. Jimmy as a German is truly shocking but that was why he was cast!